Boroughmuir suffered a sixth successive BT Premiership defeat when they went down 32-10 at home to pacesetters Ayr. However, the Meggetland men made their visitors work hard for the victory and it was only in the final quarter that the game was finally won. A try by Jordan Edmunds, converted by Dougie Steele cancelled out an earlier seven pointer by Ayr and the scores remained tied until a minute before the break when a second converted try gave the visitors the lead at half-time. It was an advantage they would not surrender although Muir battled all the way and, with 60 minutes on the clock, Steele slotted a penalty against his former team in response to an earlier effort by the away side. That proved to be the final scoring for the hosts and two further touchdowns for Ayr yielded all five league points and extended their advantage over Heriot’s at the head of the table to ten points. 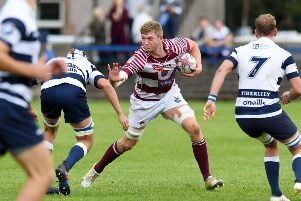 In BT National Division One, Watsonians tightened their grip on top spot with a 47-28 win at home to Kelso. Two penalties by David Blair set the Myreside men on their way and they were 18-15 ahead at half-time after Scott McKean and Callum Harvey had bagged a try apiece and Blair added a conversion. Watsonians struck shortly after the restart with Matt Coles racing over. Andrew Chalmers converted then added a penalty. Mark Bertram claimed the bonus point score for Sonians and further converted tries from Reiss Cullen and Bertram completed the win. The gap at the top has grown to nine points after Watsonians’ nearest pursuers, Howe of Fife, lost 17-10 to Edinburgh Accies. The Capital side had Argentinian full back Facundo Beltramino back in the starting line-up and he accounted for nine of his side’s points as Accies reached half-time with a 14-0 lead then booted another penalty as Accies held off a fight back by the Fifers to clinch a crucial victory. Musselburgh returned to winning ways after a three-match losing run when they produced a five-try showing to see off bottom side Peebles 36-17 at Stoneyhill and claim all five points. Stewart’s Melville also took a bonus point from their 30-14 win over Aberdeen Grammar at Inverleith. Two tries by Ross McCann and one apiece for Fraser Strachan and Sean Murchie secured the result that has moved StewMel out of the bottom two. In Division Two, Preston Lodge remain in the hunt for a top-two finish after they beat Aberdeenshire at Pennypit. The 30-24 win keeps PL in a breakaway group of five. Lasswade slipped to eighth spot in the table after going down 21-12 at home to Ardrossan Accies. Haddington moved into third place in the Division Three table thanks to a 34-8 win over Livingston at Neilson Park, but RHC Cougars were on the wrong end of a 28-14 score line in their match at home to Orkney.